Three months after the Department of Justice and BP announced they had come to an agreement to put an end to the legal debacle related to the 2010 explosion at the Deepwater Horizon oil well in the Gulf of Mexico that left eleven people dead and released millions of gallons of oil into the water, the deal has been finalized for $20.8 billion — about $1.3 billion more than the oil company estimated in July. The Dept. of Justice today said that BP has agreed to pay $20.8 billion to put an end to five years of legal back-and-forth between the federal government, five Gulf Coast states — Alabama, Florida, Louisiana, Mississippi and Texas — and the oil company. Under the finalized agreement [PDF], which represents the largest Dept. 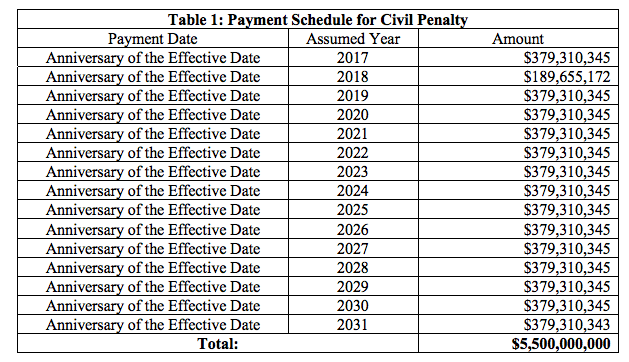 of Justice settlement with a single company, BP will pay the $20.8 billion tab in installments over a 20-year period, with the first payments occurring one year from today. 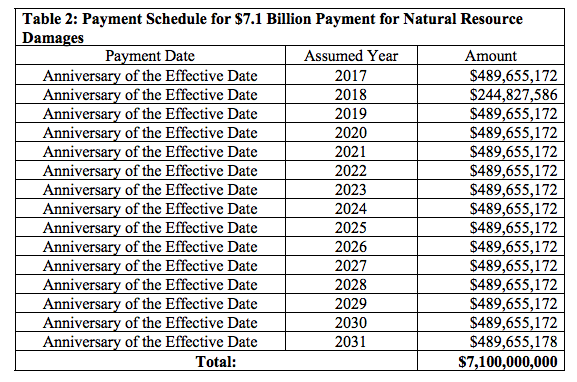 The only major change to the settlement since it was first announced in July is a $1.3 billion increase in the amount of money earmarked for natural resource damages [NRD]. Attorney General Loretta Lynch said Monday that the payout related to NRD increased because BP previously didn’t account for $1 billion in restoration work the company had previously agreed to pay. Representing the largest portion of the deal, the $8.1 billion in NRD funds will go toward federal and state efforts to repair these damages in the area of the spill. The NRD money will fund Gulf restoration projects focused on marine mammals, fish and water column invertebrates, sturgeon, submerged aquatic vegetation, oysters, sea turtles, birds and lost recreational use, among others. 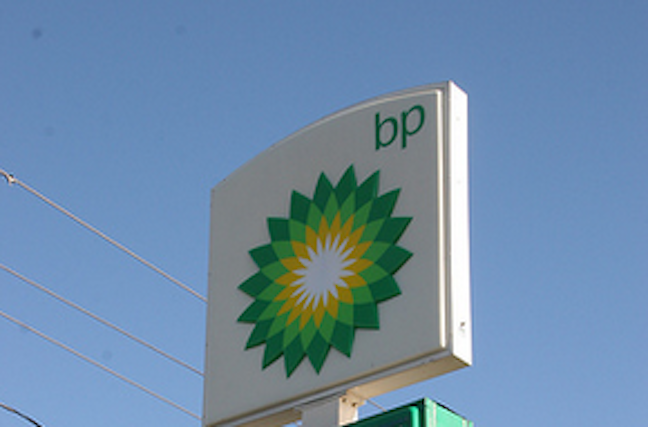 BP will also pay an additional $700 million, some of which is in the form of accrued interest, specifically to address any later-discovered natural resource conditions that were unknown at the time of the agreement and to assist in adaptive management needs, the Justice Department said in a statement about the settlement. Back in July, it was reported that payments related to restoration would cost BP $7.1 million, with $232 million set aside for additional claims. The company will also pay a $5.5 billion federal Clean Water Act penalty, plus interest. Under the RESTORE Act, enacted in 2012 in response to the spill, 80% of the penalty will be allocated for environmental restoration, economic recovery projects, and tourism and seafood promotion in Alabama, Florida, Louisiana, Mississippi, and Texas. The settlement also stipulates that BP will pay $600 million for other claims, including those for the reimbursement of federal and state natural resource damage assessment costs and other unreimbursed federal expenses and to resolve a False Claims Act investigation due to this incident, the Dept. of Justice announced. Separately, the oil company has entered into agreements to pay $4.9 billion to Alabama, Florida, Louisiana, Mississippi and Texas and up to $1 billion to hundreds of local governments to settle claims of economic damages stemming from the massive spill. The settlement will now be published in the Federal Register and will be available for public comment for the next 60 days.